Mission Viejo is a coveted neighborhood located in Orange County’s Saddleback Valley. At over 17 square miles, it’s one of the largest master-planned communities in the country. The city is primarily suburban in nature, and is known for its tree-lined streets and numerous open spaces. It also has many amenities to ensure that families can lead active, wholesome lives. Mission Viejo is definitely one of the most family-friendly communities you can move to in Southern California. Want to work on your fitness? The city has two recreation centers, Montanoso and Sierra, where members can sign up for workout routines like barre, TRX, and spin classes. There’s a water park in Montanoso where kids can enjoy a splashing good time in the summer; it also has picnic tables and benches for some al fresco dining. Got an athletic streak? You’ll be glad to know that Mission Viejo is home to two tennis centers where you can get expert coaching and guidance. If you want to put your tennis chops to the test, be sure to sign up for the club leagues. The city has many outdoor amenities that encourage active living and bring residents closer to nature. The Arroyo Trabuco Trail has 15 miles of lush trails to explore, while Aliso Creek Trail winds through 18 miles. For a beginner-friendly walk and a stunning lakeside view, head over to Lake Mission Viejo. Your kids will surely love the Mission Viejo Skateboard Facility, a public, 9000-square foot facility that has a concrete bowl, vert wall, spines, rails, and ramps. Dog lover can rejoice, too, as there is a six-acre park on Felipe Road where your furbabies can run free. Mission Viejo is home to many great elementary schools and high schools where your kids can get top-notch education. The schools are under two school districts: the Capistrano Unified School District and Saddleback Valley Unified School District. 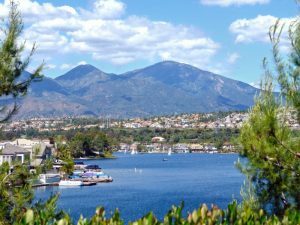 Mission Viejo has many quiet neighborhoods that are ideal for everyone from seniors to families of all shapes and sizes. Homes here tend to be single-detached, complete with spacious, well-tended lawns. Likewise, homes tend to be bigger, with floor sizes usually starting at 1,500 sq. ft. and going all the way up to over 7,000. Floor plans and architecture also vary, usually depending on the community, though some styles – such as the quintessentially Californian Mission Revival – are particularly popular. As for price, homes typically range from the mid-six figures to the low sevens. These two shopping centers are home to a robust selection of retailers, restaurants, and entertainment centers. This private golf course and country club is almost as old as the community itself. Designed by Robert Trent Jones, Sr., the championship course is as beautiful as it is challenging. Other amenities include a tennis facility, fitness center, aquatics center, dining venues, and more. Designed by Tom Lehman and Casey O’Callaghan, this public 18-hole course has five sets of tees and boasts amazing views of the nearby mountains and the Reserve at Rancho Mission Viejo.